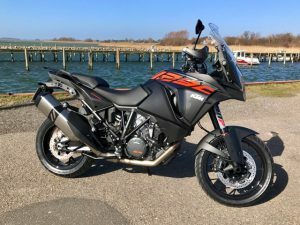 I have been considering the KTM 1290 GT for some time, but I was never 100% convinced that it was the right next big bike to take over from the 990 SMT. I got the very first Super Adventure S in Denmark, and it’s the most impressive bike I have ever been riding. First, I’m now completely convinced that a bike with 19” front wheel can be both completely stable and flickable at the same time. I’m not sure how KTM did this with a bigger front wheel and the rather long wheelbase, but the bike is as easy and fast to throw into a corner as my SMT (that was also 10 kgs lighter). But they did it for sure. You can feel the big engine being alive all the time, but there is no unpleasant vibes or resonances. That engine is a marvel. Gearbox is KTM slick with positive stops and no false neutral. They just make very good gearboxes at KTM. It took me around 100 km to get acquainted to the quick shifter, but mind that I have no real previous experience in that field. I got the hang of it and the clutchles shifts got smoother and smoother during the first day. Brakes was just perfect as you would expect from Brembo radial callipers and radial master cylinder. No big surprises here, but I did not ride the bike really hard or near any limits. The electronic suspension was truly amazing and you could immediately feel the difference between the different settings (Comfort, Street, Sport). Comfort is great for highway riding and will soften up very bumpy roads, but when you push the bike harder on twisty roads, it’s get a bit unstable – just as you would expect. Street or sport damping will help you out. In comfort and Street mode, there is an antidive function where the damping is increased when you brake. Probably a great feature for touring, but you lose a bit of the feel for what the front wheel does, but just switch to sport mode and you get the normal brake dive back which also makes the steering faster. But the verdict of the suspension is that it is fantastic. The bike feels planted on the road to a degree I have never experienced before, and it simply just adapts to the changing conditions on the road. (I deliberately took a route today where I would meet all kind of road conditions). It’s not super heavy for a big bike, but not race bike light either – but all the kilo’s just disappear when you ride the bike and the Ducati term for semi-active suspension “Sky-hook” suddenly seems logical. 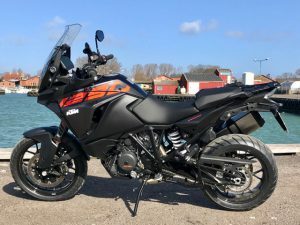 The relation between handlebar, seat and pegs was as expected – more or less the same as on the 1190 or on the SMT, and the handlebar was not too wide for road use like on the R1200GS. So I’m retaining my favourite “attack” seating position where I’m leaned slightly forward and can easily transfer more weight to the front. 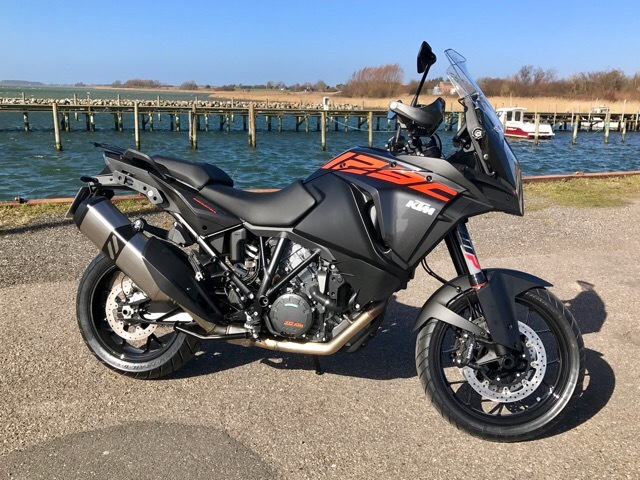 Very good, and far from the upright position on the Multistrada or the S1000XR and worlds apart from the stupid seating position on the R1200GS where you are almost leaning backward. 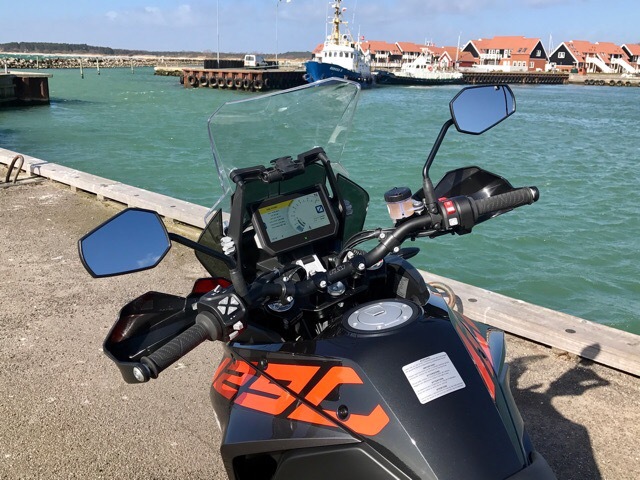 Wind screen is very good, and there is no turbulence or excessive wind noise for a rider of my height (187 cm), neither with the screen in the upper or lower position. Assembly and build quality is very good and getting very, very close to top of the line BMW or Honda bikes. KTM have definitely come a long way since they build my SMT in 2009. Final verdict: For a “one bike to do everything” is is certainly the best I have ever tried. My 690 Duke is better for backroad scratching, a S1000RR is better on the racetrack, a R1200RT would be more comfortable on a 1000 km motorway trip, etc, but the 1290 is not doing bad in any of these disciplines, and I’ll claim that it’s the most versatile big bike you can find. Did I mention that I really like this bike ?